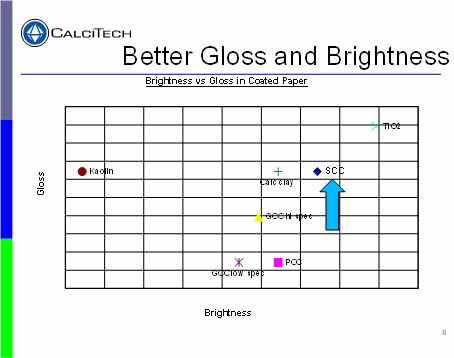 SCC can simultaneously improve both the brightness and opacity of coated paper. Other qualities improved with SCC use are gloss, print gloss, smoothness and printability. When SCC is used in the coating, less time and energy is required to dry the paper - owing to the unique particle size and morphology there are increased pathways for moisture to escape. Additional productivity increases are achieved in cases where calendaring is necessary. In trials it has been found that the use of SCC leads to significantly reduced calendaring requirements. Abrasive contaminates normally found in existing ground and precipitated calcium carbonate products are absent from SCC. This means that machine wear will be reduced. This leads to less expensive own time for maintenance and further cost savings as expensive blades have an extended economic life. Other cost savings can be achieved through a reduction in binder and other additive needs and the extension (partial substitution) of expensive materials. It has been found that the use of SCC increases polymer strength in a number of situations. SCC products are extremely pure. 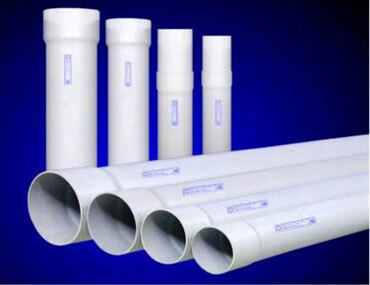 This leads to improved whiteness and thermal stability in sensitive applications, for example in PVC window profiles. More and more calcium carbonate is being included in polymer compounds to improve sustainability by offsetting oil based polyolefin resins. SCC, derived from waste raw materials and with a negative carbon footprint, is especially suitable for this purpose. The narrow particle size distribution of SCC will give the optimum balance between mechanical and rheological properties in a wide range of sealants and adhesives. SCC will enhance formulation flexibility. In silicone sealants, for example, SCC allows for an increase in filler loading. The very consistent hydrophobic coating on SCC enables easier dispersion and a shorter process cycle. The micro porous structure of SCC combined with the narrow particle size distribution will enhance the optical properties in decorative paint. 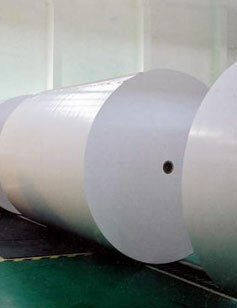 Due to the low Iron content of SCC, higher whiteness and further TiO2 extension are also possible. With virtually no agglomerates and large particle contaminants, dispersion of SCC powder requires less energy. Where required, the paint gloss is also improved. SCC, derived from waste raw materials and with a negative carbon footprint, is more sustainable than other functional extenders, including calcined kaolin and precipitated calcium carbonate. Particles and agglomerates over 3 micron are virtually absent, so SCC is suitable for silk screen and tampon inks, together with other aqueous based inks where the print thickness is very small. The easier mixing of SCC with pigments and the better rheology give improved ink transfer properties along with excellent opacity and brightness. SCC contains very low amounts of heavy metals. This satisfies the increasing need of ink industry for food contact certification. The extremely high purity of SCC food and pharma grades ensures compliance with the strictest current and future purity standards. Due to the fine particle size and to a low top-cut of 3 microns, SCC enables calcium enriched milk and beverages to be made without sedimentation and without a chalky taste. SCC rheology also provides good process filler results with chewing gum, bakery products, cereals, yoghurts, chocolate, etc. The ability to mix SCC with other ingredients enables it to be used as an excipient or combined with other excipients for the nutraceutical and pharmaceutical industry. The extremely low iron content of SCC is a unique advantage in the production of special glass including ultra-clear, ophthalmic and new solar panels.